A brilliant display under top weight in January's Thyestes Chase at Gowran Park earned the six-year-old a shot at the blue riband in March and he ran a fantastic race to beat all bar Coneygree in the Prestbury Park showpiece. 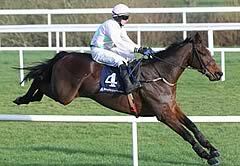 Making his first appearance since chasing home Don Cossack in the Punchestown Gold Cup the following month, Willie Mullins' charge was the 7-4 favourite for this two-and-a-half-mile Grade One and after briefly tracking 2012 winner Flemenstar, he was soon bowling along at the head of affairs. Djakadam jumped well throughout and a bold leap at the final fence before the home turn saw him open up a gap on the rest of the field. Stable companion Valseur Lido gave chase in the straight, but could never get on terms with Ruby Walsh's mount, who passed the post 12 lengths to the good. Coral trimmed Djakadam to 8-1 from 10-1 to go one better in what promises to be enthralling Cheltenham Gold Cup next spring. Walsh said: "Flemenstar wasn't going that quick, so I decided to let him stride along. He jumped super and quickened up really well and it was a good performance. "They were good horses (behind) - Gilgamboa, Clarcam, Valseur Lido, Foxrock - I expected something to be coming to me turning in. "He was second in the Gold Cup as a six-year-old to a very good winner. "I'm sure we'll learn a lot more in the Lexus Chase if he takes on Don Poli and a few more. That'll be a hell of a race." RaceBets make Djakadam their 9-4 favourite (from 4-1) for the Lexus on December 28. Mullins said: "Valseur Lido will appreciate stepping out in trip and both of them will come on a lot from that run. Henrietta Knight said he (Djakadam) will win the Gold Cup, so I'll quote her. "I wasn't happy with him during the week and was nearly not going to run, but to run like that after the way he was, I'm absolutely delighted with him. "He just wasn't right but as Punchestown is our home track I could leave the decision until this morning. If the race was run in England it wouldn't have been as easy and I would have had to make a decision during the week. It was some performance considering everything. "He could even beat the loose horse (Hidden Cyclone) the form he was in! "There is no decision at the moment on where he will go next."